I’m pretty sure that if you thought about a brand style photoshoot, you’d be thinking about the end result. A glamorous model advertising the latest fragrance, or perhaps something more iconic, like Nike’s 2018 “Believe in Something” campaign image featuring Colin Kaepernick, which sparked controversy. You begin to think of Coke’s polar bear images of Christmastime, that juicy Big Mac in McDonald’s imagery, or even perhaps flicking through that Ikea catalog that comes through your mailbox each year. These iconic images all have a common starting point – a brand styled photoshoot. The end result is those magical images that evoke those emotions and feelings that make your brand remarkable, but getting to that end result can be tricky. Here’s my guide to a stress-free brand style photoshoot – along with my tips to make it a lot easier for yourself! Pinterest is a fantastic tool that I use a lot in my work. From building mood boards to creating imagery around brand archetypes, I use Pinterest for visual inspiration. For brand styled photoshoots, I always make a secret board and start pinning images that connect the ideas I have in my mind. It’s a mix of everything – color palettes, image styling, composition – anything that inspires me and ties into the brand image I want to portray. It helps me to be clear on what possibilities there are, but also about location, styles, etc. From there, I take out the best images and load them into Illustrator Mood Board file, making my shortlist and photoshoot goals crystal clear. You really need to plan out everything in the process. It’s more than just planning an outfit, and a location, but you need to make sure you have the props, the lighting, what type of shot you need, and even what direction the shot should come from. It’s a good idea here to make a Google spreadsheet and make a list of every photo you need. Go into detail about where the photo will be used, what angle you need it from, will it be used as a header image, or is it a headshot. Even put down what colors you need in the shot and what other materials and props should be there too.! The more information you have about the shot, the better. Even down to if you need a certain focus, or if you need a blurred background. Will it be in color? Black and White? A certain filter? Defining all of these things helps to guide the shoot, make it efficient, on point (and on cost!) and aligns everyone. Make sure you talk with your photographer beforehand about your ideas and send them your shot list and your mood board. It’s super important that they know what equipment to bring and support and guide you through the shoot. The photographer also needs to know how the images need to be edited, and how they are going to be used. They can also advise on a lot of things – so be sure to involve them in your process. It’s really important to choose a location that ties in with your brand, but also, make sure you have a backup plan. I recommend visiting your location beforehand and making some test images of places you think would work and discussing these with the photographer. (make sure you always note the time of day you take these pictures, your photographer will LOVE you). After you’ve done all these things, it’s important to make a list of all the things you need. Do you need a hair and makeup person? Do you need a new outfit? Should you get your nails done? Give yourself plenty of time to get all this together, so on the day, you can really shine. Ready … steady … GO? Even the best-laid plans can still go up in the air – and I should know! For my own re-branding shoot this year, I had everything planned out so well. I had my mood boards, my photographer lined up, my venue booked, my outfits ordered … Everything was going so smoothly! The first disaster was that my clothes I’d ordered for the shoot wouldn’t arrive in time. I’d set up my shots with specific outfits – and then there was a shipping delay with no warning! Then, I couldn’t get a nail appointment. This was tricky because I had closeup shots of my hands that I wanted. I mean, it’s not really that big of a deal if you can’t get the perfect brand matched color, but when you break 2 nails the day before – it can really throw off your plans. And then – I didn’t follow my own advice. I should have booked my hair and makeup person in advance – but she was already booked on the day. I was on my own for my hair and makeup that day. By this time, I was really freaking out. I was so lucky that I had my assistant by my side to calm me down, and also help refocus. She took charge and managed to cancel the external venue I’d booked – and we focused the shoot more around the iGina office instead. This I think is the most important thing you can take away. You can be super prepared, have a million backup plans, and have it all under control – but you need to be prepared to go with the flow. 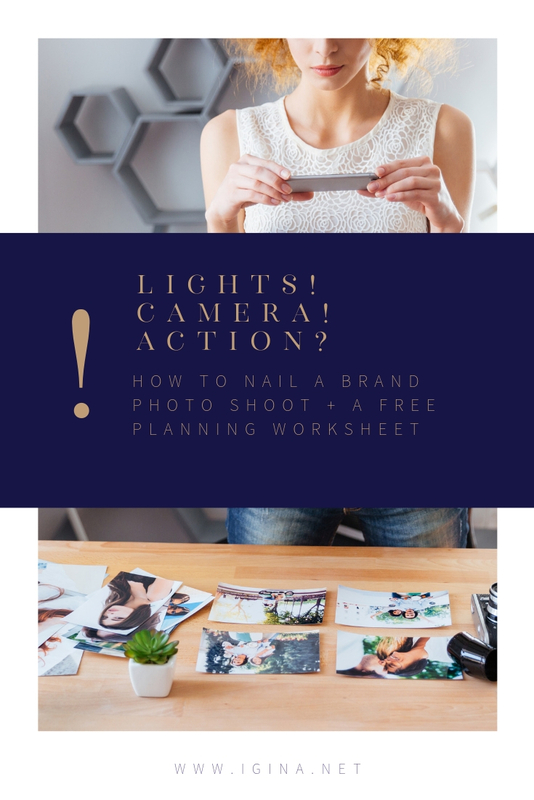 If you need a hand, start with downloading our Photoshoot Planning Worksheet here. For all sorts of reasons, the best-laid plans can go to pieces. It’s times like these that you go back to your preparations, stay calm, and start thinking about what you can change, and how you can adapt. What did happen was we had a fantastic day, and because we had everything mapped out, we were still able to get the shots we needed and improvise to get the rest. Having a clear plan helped keep things on track! p.s. Did you know you can have a brand styled photoshoot through iGina? Get in touch to find out how!